Heat the milk in a deep-bottomed pan let it boil. When it comes to a boil, add the lemon juice, stir and turn off the heat. Let the mixture cool and then drain it in a muslin cloth or sieve. Press it hard to remove extra water and cool completely. If you use a cupful of home-made curds with a teaspoonful of vinegar mixed in it, in the place of lemon juice, your paneer will turn out much softer and creamier. The milk need not even be full cream milk. I use cow's milk, skimmed, and it still makes excellent paneer using this method. Paneer is the most common South Asian and Persian cheese. 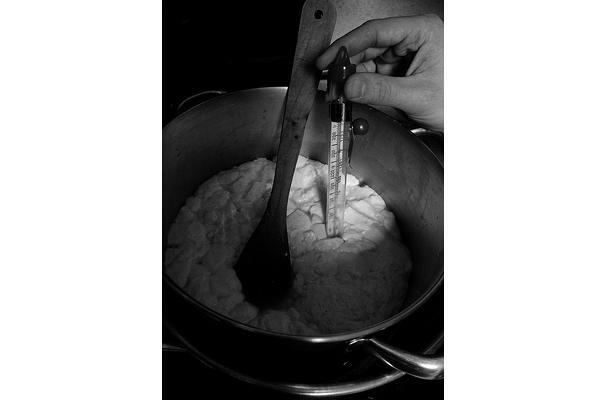 It is an un-aged, non-melting farmer cheese made by curdling heated milk with lemon juice or other food acid. Making paneer at home is easy. Try it at home for pure and fresh Indian cottage cheese.